When you think of a salad, you think of a delicious and healthy meal filled with nutrients for your body. However, I have found this somewhat untrue for salads that may be on the menu at your favorite restaurants! 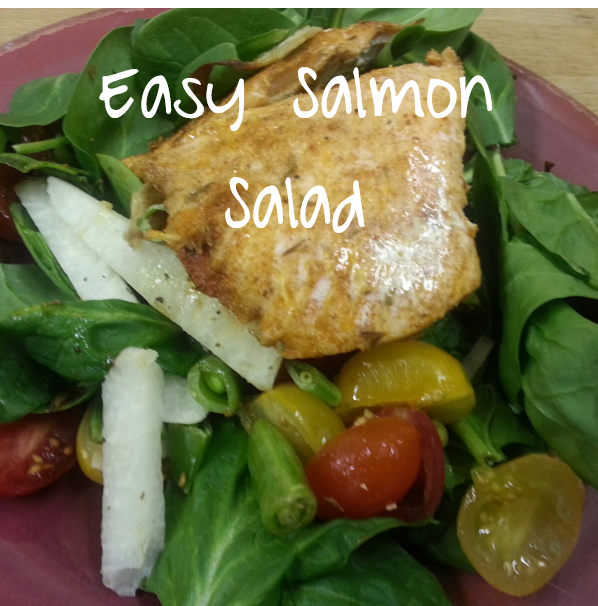 Instead of filling your body with the nutrients that you need, you are filling it with excess sodium and fat.I’m here to show you tips and tricks for making your salads healthier or choosing the right type of salad when going out to eat. Ask for salad dressing on the side – This is the biggest thing that you can do without even realizing it. Most restaurants will add a ton of salad dressing to your salad, causing the salad to wilt and be drenched. By asking for the dressing on the side, you will be in control of the amount that you add to your salad which in turn cuts down on sugars or sodium that the dressing may contain. If at home, try making you own salad dressing. Mix 1/2 cup coconut oil along with 1/2 cup olive oil along with italian seasoning for a dressing packed with healthy fats and omega 3’s! Use Portion Control – Have you ever gone to a restaurant, ordered a salad, and your server has come back with a salad that could feed two or three? Instead of attempting to eat the whole thing and telling yourself that it is healthy, ask for a box before you indulge. Place half of the salad in your box and resume eating your meal. This will help to keep you in control of eating the correct amount of calories for your body while also having lunch for the next day as well. Know Your Greens – Think all salads are healthy, wrong! Did you know that iceberg lettuce, a common salad ingredient, ranks the lowest in nutritional value. Iceberg lettuce has a 96% water content, which in turn doesn’t do a whole lot for your body. Try asking for an alternative to iceberg in a salad, most restaurants will substitute if they have what you’d like. Healthier alternatives include spinach, kale, or romaine. A favorite throughout the office is our easy salmon salad, packed with omegas and medium chain triglycerides. Skip the Cobb – Cobb salad, a traditional on most menus, but one of the unhealthiest salads for you. Chopped bacon, egg, bleu cheese, avocado, and a creamy dressing can add up to more than 1,000 calories and 80 grams of fat! If you’re calorie counting that may add up to over half of your daily calorie intake and may be pushing the limit for fats as well. Opt in for a lighter salad that will keep you full and satisfied but is packed with veggies. Don’t Forget the Protein – Just because you are sticking with a low calorie salad with dressing on the salad, don’t think you need to loose the protein. This can be a great flavorful addition to your favorite salad. If you’re looking for animal protein try egg whites, skinless chicken breast, or lean sirloin steak. If you’re following a vegetarian or vegan diet choose tofu, chickpeas, kidney beans or other legumes. Stay away from your fatty meats like bacon or salami and skip the fried chicken or anything drenched in a heavy sauce. If you slowly take these steps in choosing a better salad option, you’ll get a more nutritious lunch. Your meals will be packed with vitamins and nutrients to keep you full until dinner. I have honestly eaten a full cobb salad before and thought oh I feel great I had a salad for lunch. Little did I know that I probably ate too much and could have chosen a better option for myself. I find that salads are a great way to get your daily intake of fresh vegetables, especially if you are not a big veggie lover like myself!